Emma Logan is unknown to the Canadian women’s Deaf curling community, but not for long. 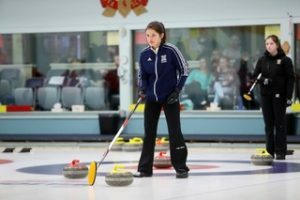 The 20-year-old Nova Scotian has been curling since the age of 11, but her participation at the 2018 Canada Deaf Games this month will be her first experience competing among Deaf and hard of hearing athletes. Logan will play in the interprovincial team formed of one player from Saskatchewan and two players from Manitoba, including Sylvia Sigurdson. Sigurdson is the oldest curling player (75) to have won a bronze medal at the 2015 Winter Deaflympics in Sochi, Russia. Logan and the team are one of the four women’s curling teams competing at the Games. For her first participation at a Deaf and hard of hearing sport event, Logan doesn’t have specific expectations. “As it’s my first time competing in a Deaf event with teammates I’m unfamiliar with, I don’t have any expectations. My goal for the week is to get to know each other early, adjust to not being able to hear while curling and have fun! To win would be fantastic, but this is secondary to enjoying the experience during the week,” said Logan. 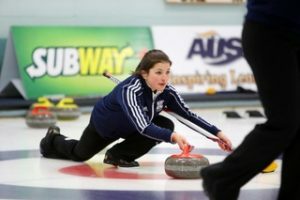 Logan skips for the St. Francis Xavier University women’s curling team, that won the 2017 Atlantic University Sport Championship giving them the honour to represent St. Francis Xavier at the USport National Championship. Logan is a third year student in the Bachelor of Business Administration program. Logan is very excited about her upcoming participation at the Canada Deaf Games for several reasons, including being able to ‘go natural’. “I wear a hearing aid and cochlear implant on a regular basis and don’t get the opportunity to go natural by participating in events without wearing them. This will be a new experience for me,” she said. Logan believes she will learn a lot about herself and others at the Games. “I hope to learn some American Sign Language (ASL) too!”. Curling allows Logan to travel, meet new people across the country and develop new friendships. The Games will give her the opportunity to do all of this while being a new experience, so she is looking forward to be in Winnipeg from Feb. 21 to 24. The curling games will be on Feb. 21, 22, 23 and 24. Consult the women’s curling schedule.